Cassandra Bowden is a heavy drinker, prone to blackouts. Such is the case after she landed in Dubai, and spent the night with a passenger she had met and flirted with on her flight. She woke up in his hotel room in the morning, bits of the evening slowly coming back to her: drinking lots of arak, coming back to the hotel room, a female guest named Miranda who brought a bottle of vodka, breaking the bottle, leaving the hotel room. Yet here she still was. Then Cassie finally turned her head to look at Alex Sokolov, and saw that he was dead. Panicked, she feared that maybe she killed him. Even if she hadn't, just being beside him in the bed would surely implicate her. So she slipped out of the room and caught her next flight. This isn't a whodunnit. We know who did it by the next chapter, though we don't know why. More important though, is what happens to Cassie, the fallout from her decision to say nothing and leave the hotel room as though she didn't know a murder had taken place there. What could possibly make a person look more guilty? Especially a person known for being a party girl, for hooking up with a lot of guys, and for generally being irresponsible. Do you ever read a book, see what the protagonist is doing, and want to shake them by the shoulders and tell them it's a really bad idea? I felt a little bit like that with Cassie, but it was also easy to understand why she made the choices she did. She didn't make these choices because the author needed her to in order to advance the plot; her choices were completely believable for her character. Her weaknesses were real, and they determined her behaviors. It wasn't pretty, but it was genuine. But back to the plot. I don't want to give too much away, but there's some international spy activity happening here involving Russians. And Cassie, in addition to hoping she won't lose her job because of her involvement in a murder (oh, of course it comes out! She didn't cover her tracks that well) has a strained relationship with her sister who doesn't trust her, and the baggage of their whole family situation. During this whole time that Cassie is waiting for the authorities to figure out she was in the hotel, and then waiting for the consequences of her involvement, she's trying to go about her regular life. She's reading Tolstoy's novella Happy Ever After, and keeps putting off getting a manicure because of inconveniences like having to meet with her lawyer. She also thinks a lot about her drinking, how much she enjoys the ritual of alcohol, how she's not an alcoholic because she can go days without drinking. But, all it took was one Negroni (her drink of choice) to start her on an all-night binge that resulted in hours of lost time. I was drawn into this story from the very first page. In the scope of Bohjalian's work, it reminds me most of The Guest Room, perhaps because someone who is essentially a bystander makes one poor decision and gets drawn into an international crime scene. But another way that The Flight Attendant is similar to that book is that I'm likely to keep thinking about the main character for a good long time. 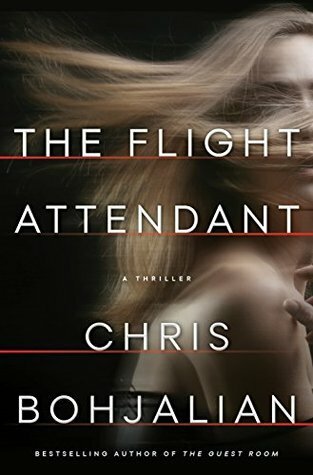 The Flight Attendant will be published in March 2018. I received my copy courtesy of Penguin Random House. I was not compensated for this review.